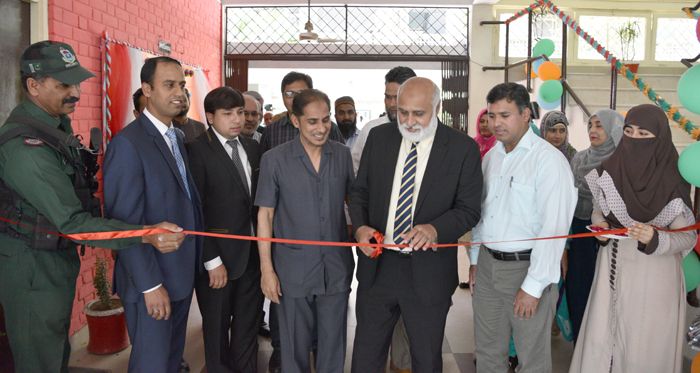 LAHORE: (Wednesday, April 3, 2019): Punjab University Vice Chancellor Prof. Dr. Niaz Ahmad Akhtar inaugurated the newly constructed Seminar Hall, Mosque and Renovation Work at Department of Mathematics, University of the Punjab, Lahore on Tuesday, April 2, 2019. Prof. Dr. Muhammad Sharif, Chairman, Department of Mathematics, and large number of faculty members, students and employees were present on the occasion. In his address, Prof. Dr. Muhammad Sharif, briefed the achievements of the Department of Mathematics during his tenure and informed that a lot of renovation work including renovation of departmental lawns, tile work, renovation of computer and research labs, purchase of furniture, construction of M.Phil./Ph.D. classrooms, labs, Seminar Hall and up-gradation of departmental networking and library have been taken place. He told that 40 Ph.D. and 141 M.Phil. students were produced during this six years period and published 686 research articles out of which 503 were published in Impact Factor Journals. On this occasion, Prof. Dr. Muhammad Sharif presented a Cheque of an amount of Rs. 2.5 million to the Worthy Vice Chancellor for P.U. Medical and Dental College. In his address, Prof. Dr. Niaz Ahmad Akhtar, Vice Chancellor, University of the Punjab appraised the achievements of the Department of Mathematics and said that the development in the infrastructure of the Department of Mathematics is really admirable.